The first Kamehameha class celebrates reunion, 1916. For the 25th anniversary of their graduation from Kamehameha School, the boys of the class of 1891 are looking back; it is the first class that graduated from that school, under the principal Rev. W. B. Oleson. The 10th, 11th, and 12th of upcoming June will be set aside as time to reflect by the students still alive today. From within the class of 14 that graduated in 1891, there are 12 of them still living, and two that passed away. Those residing in this town are: Charles E. King, Samuel Keliinoi, Frederick William Beckley, Solomon Hanohano, William K. Rathburn, and John K. Waiamau. 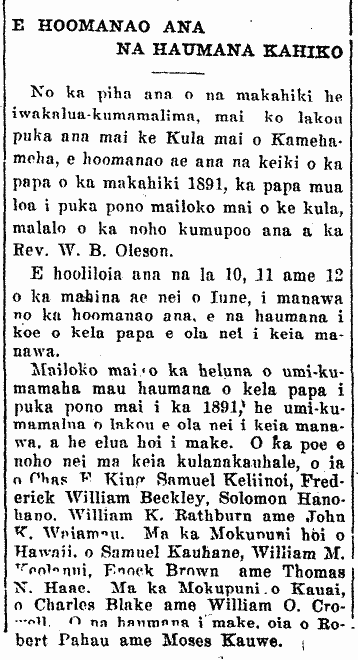 On Hawaii island are Samuel Kauhane, William M. Keolanui, Enock Brown [Enoch Brown], and Thomas N. Haae. On Kauai is Charles Blake and William O. Crowell. The students who passed away are Robert Pahau and Moses Kauwe. Ka Nupepa Kuokoa, Buke LIV, Helu 19, Aoao 1. Mei 12, 1916. Laws pertaining to hula in English, 1859. Laws pertaining to hula in Hawaiian, 1859. Can there be a Kanilehua Rain if there is no more lehua? 1893.